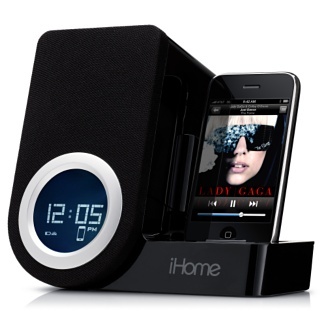 Easily watch videos in landscape mode on your iPhone or iPod simply by rotating the iHome iP41. Also wake and sleep to the music on your iPhone or iPod. You can rest assured you'll get great sound. Dock your iPhone or iPod and listen to the sound of your favorite music—beautifully reproduced by the iP41's Reson8 speaker technology and EXB expanded bass circuitry. Now you can wake to a choice of music or videos on your iPhone or iPod. If you want to see the video in full screen mode, just rotate the iP41 onto its side. When you change the orientation of the overall unit, the LCD clock display also shifts so it's still easily readable. Anyone who wants to occasionally watch a widescreen video on their iPhone or iPod while it's in the dock.